Interstate 480 connects the Ohio Turnpike (I-80) with Cleveland and the Cuyahoga County suburbs. Following the Outerbelt South Freeway, I-480 follows a 42 mile long course between North Ridgeville in Lorain County and Streetsboro in Portage County. Entering Cuyahoga County 1.25 miles east of the Ohio Turnpike toll plaza, I-480 trends northward through the city of North Olmsted to Great Northern Mall and SR 252. The freeway parallels SR 17 east from Fairview Park to Cleveland Hopkins International Airport (CLE) in southwestern Cleveland. Straddling the Cleveland and Brook Park city line, Interstate 480 proceeds eastward into Brooklyn. The Outerbelt South Freeway rejoins the corridor along SR 17 through the Old Brooklyn neighborhood in south Cleveland. I-480 bends southward from the exchange with SR 176 (Jennings Freeway) to the village of Brooklyn Heights and the four level interchange with I-77. East from Interstate 77, I-480 crosses the Valley View Bridge. The twin viaducts extend 4,155 foot high above the Cuyahoga River, the Cuyahoga Valley Railroad and Canal Road. The 1975-built spans1 lead I-480 into the city of Garfield Heights, where the freeway again crosses SR 17. Interstate 480 runs along the Maple Heights city line by southeast Cleveland and Warrensville Heights to the split with the I-480 north branch. Referenced as Interstate 480N on Intelligent Transportation System (ITS) markers, the north leg of I-480 connects the Outerbelt South Freeway with both Interstate 271 north to Euclid and U.S. 422 east into the city of Solon. The mainline of I-480 angles southeast from SR 8 and I-480N into Bedford Heights, where it combines with Interstate 271 south. The I-271/480 overlap is one of two branch route combinations in the Interstate Highway System. The 3.3 mile long concurrency leads south through east Bedford and into the village of Oakwood. Crossing the Summit County line at Madedonia, I-271 continues southwest to Northfield Center Township and the village of Richfield. Interstate 480 resumes a southeasterly heading to the city of Twinsburg and Twinsburg Township. I-480 concludes at the trumpet interchange and access road joining the Outerbelt South Freeway with the Ohio Turnpike at SR 14. 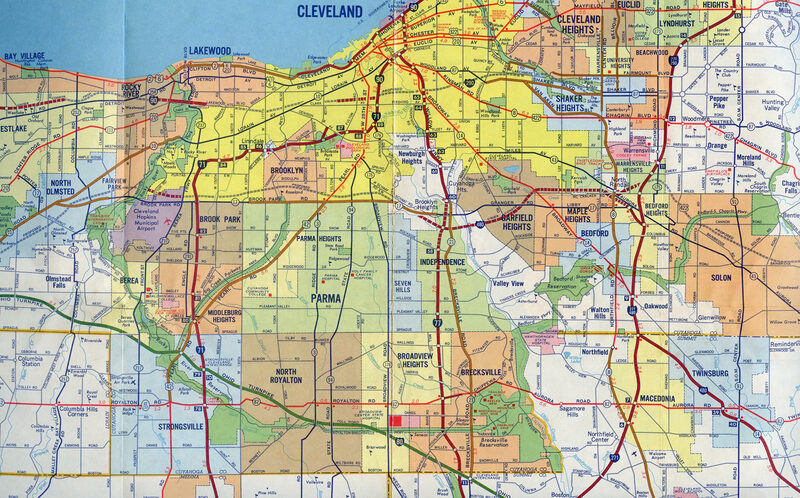 Cleveland metropolitan area – 1973. The first stretch of Interstate 480 open to traffic was the eastern leg from the Ohio Turnpike at Streetsboro and the 5-mile overlap with Interstate 271. I-480 temporarily ended at Ohio 17 (Libby Road) in Bedford Heights, just beyond the split with I-271 north. 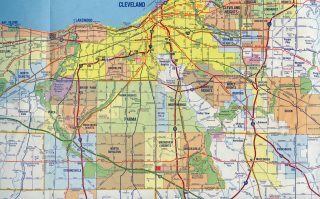 The Outerbelt South Freeway was initially proposed as the southern leg of Interstate 271 west from Maple Heights to I-71 in southwest Cleveland, and as part of Interstate 80N southeast from Maple Heights to Streetsboro. This changed by 1963 with the Outerbelt South Freeway designated as part of transcontinental Interstate 80. I-80 eventually shifted south along the remainder of the Ohio Turnpike in 1971, with Interstate 480 was established at that time. Ohio 14 combines with Interstate 480 southeast from the village of Oakwood to the eastern end of the Outerbelt South Freeway at I-80 (Exit 42). Photo taken 05/25/02. The Outerbelt South Freeway crosses over I-80 just ahead of Exit 42. Ohio 14 continues southeast from I-480 as a commercial arterial into Streetsboro. Photo taken 05/25/02. A trumpet interchange and access road link I-480 east and Ohio 14 with the Ohio Turnpike at Exit 42. Photo taken 05/25/02. Traffic partitions beyond the toll plaza at Exit 187 for the Ohio Turnpike east to Youngstown and Pittsburgh, Pennsylvania and I-80 west to Toledo and South Bend, Indiana. Photo taken 05/25/02. Two miles ahead of the trumpet interchange (Exit 187) and access road joining the Ohio Turnpike with I-480 and Ohio 14. Photo taken 09/01/05. Continuing west through Streetsboro, I-80 (Ohio Turnpike) is one mile ahead of Ohio 14 east and I-480/OH 14 (Outerbelt South Freeway) west Photo taken 09/01/05. Interstate 480 and SR 14 angle northwest from the Ohio Turnpike 10.6 miles to I-271 at Oakwood in southeastern Cuyahoga County. Photo taken 09/01/05. Exit 187 leaves I-80 (Ohio Turnpike) west for SR 14 south to Streetsboro and Ravenna, I-480 west to Cleveland and SR 14 north to Bedford. Photo taken 09/01/05. Trailblazers for I-480, SR 14 and I-271 at the trumpet interchange with the Outerbelt South Freeway beyond the Ohio Turnpike toll plaza. Photo taken 05/25/02. Interstate 80 (Ohio Turnpike) advances east from the city of Hudson in Summit County to the trumpet interchange (Exit 187) and access road to I-480 (Outerbelt South Freeway) and SR 14 at Streetsboro. Photo taken by Patrick Lilja (07/17/06). Exit 187 departs Interstate 80 east for I-480 & SR 14 north to Twinsburg and the commercialized stretch of SR 14 extending southeast to the Streetsboro city center. Photo taken by Patrick Lilja (07/17/06). Westbound Interstate 480 ends 2.5 miles beyond Exit 3 to Stearns Road in the city of North Olmsted. Photo taken 05/25/02. The last mainline exit from westbound Interstate 480 connects with Ohio 10 east. Ohio 10 briefly merges with I-480 west before diverging southward onto a freeway to U.S. 20 near Norwalk. Photo taken 05/25/02. Exit 2 departs for Ohio 10 (Lorain Road) east back into North Olmstead. There is no access to I-80 east from I-480 west. Instead motorists must make a Breezewood connection via Lorain Road south to the Ohio Turnpike interchange at Exit 152. Photo taken 05/25/02. Exit 1 is the wye intersection where SR 10 separates south to U.S. 20 and I-480 merges onto the Ohio Turnpike westbound. Photo taken 05/25/02. Two lanes partition for both SR 10 west to Oberlin and Norwalk and the Ohio Turnpike (I-80) west to Toledo and Chicago, Illinois. Photo taken 05/25/02. Eastbound I-80 approaches Exit 151 and Interstate 480. I-480 rejoins the Ohio Turnpike at Exit 187. Photo taken by Steve Hanudel (07/04/06). One mile ahead of the split with Interstate 480. The Ohio Turnpike was expanded from four to six lanes through the late 1990s and 2000s. Photo taken by Steve Hanudel (07/04/06). Interstate 480 branches northeast from I-80 toward Cleveland International Airport (CLE) a half mile beyond the Ohio 83 overpass. Photo taken by Steve Hanudel (07/04/06). Exit 151 constitutes a wye interchange with I-480 (Outerbelt South Freeway) east to North Olmstead, Fairview Park and Cleveland. Interstate 80 bypasses most of the Cleveland metropolitan area the south and crosses Cuyahoga Valley National Park en route to Youngstown. Photo taken by Steve Hanudel (07/04/06). Page updated May 29, 2015.